WASHINGTON — Frustration over lagging modernization has reached a tipping point in the U.S. Army. The Army is especially pressed to improve its technology game as Russia continues to flaunt advances in ground and electronic warfare, including spy drones and jammers that disrupt satellite communications and navigation. “We will be drilling down hard on that one,” Army Chief of Staff Gen. Mark Milley said of electronic warfare. 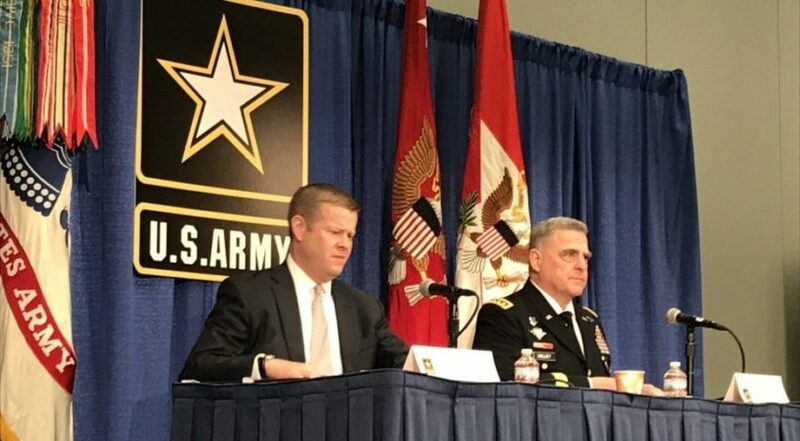 Milley spoke Oct. 9 at a joint news conference with Acting Army Secretary Ryan McCarthy at the Association of the U.S. Army’s annual convention. One of the priorities is to equip the Army with a “mobile and expeditionary” communications and command network, McCarthy said. Other items on the list: air and missile defense, long-range precision fires, next-generation combat vehicles and helicopters, and more lethal weapons for individual soldiers. Officials are taking another stab at fixing the Army’s longtime modernization problems, which are now coming to a head. In its new guidelines to commanders, known as “Field Manual 3.0,” the Army warns that major regional powers like Russia, China, Iran and North Korea are “fielding capabilities to deny long-held U.S. freedom of action in the air, land, maritime, space, and cyberspace domains and reduce U.S. influence in critical areas of the world.” In some areas they already have “overmatch or parity,” a challenge that U.S. forces have not faced in decades. The details of the reorganization will hashed out by a team led by the director of the Army’s business transformation office Lt. Gen. Edward Cardon. He has four months to come up with a plan to create a new command to take charge of Army modernization. “We want to get the new organization stood up by summer 2018,” said Milley. The Army’s chief information officer Lt. Gen. Bruce Crawford said he worries about the sophisticated ways in which enemies combine “information operations, cyber and electronic warfare.” He said satellite communications are particularly vulnerable. “This is a threat environment that I have not seen in 31 years of service,” he said at a separate news conference at AUSA. After a lengthy review, the Army decided to suspend procurement of the mobile command-post version of the $6 billion tactical communications network known as WIN-T due to its susceptibility to enemy jamming and cyberattacks. Program executive Gary Martin said the Army will seek proposals from vendors on ways to equip forces with reliable communications in situations when satellite signals are jammed. Experts have warned for years that while Russian electronic warfare has advanced by leaps and bounds, U.S. Army technology has been stagnant. “Russia does have a wide range of electronic warfare capabilities to disrupt adversary’s communications on land and air, in a localized and long-range capacity,” Samuel Bendett, a Russia expert at the CNA Corporation, told Space News.